The name of this DIY is suiting since recently it seems like there just isn't enough time. Getting ready to move into a different house seems to come along with 10,000 new house projects and decoration ideas and I just can't find enough time to do all of them. We found this pack of flat corner irons while going through some old stuff the other day. I decided to make a quick necklace with these "V" shaped metal pieces. Also, they're super super old so you could call this a semi-vintage neckalce if you really wanted to. It literally took about 5 minutes to make this necklace. Cut the chain to the length you want. Attach the ends of the chain to the flat corner iron with jump rings. Cut the chain open in the middle back part of the necklace. Attach a jump ring to one end and attach a lobster claw (with a jump ring) to the other end. Close up the back of the necklace and you are done! You can make this necklace as short or as long as you'd like and you could get smaller pieces. 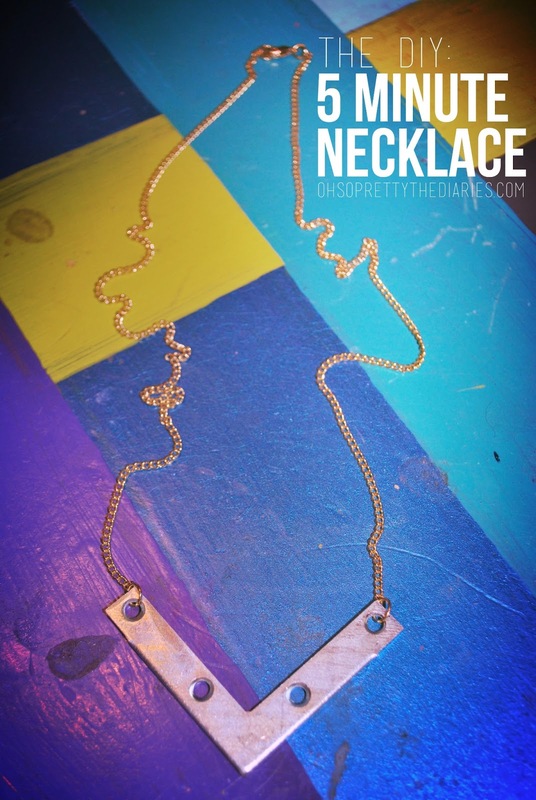 We may try different versions of this necklace with other sizes and we may even experiment with some spray paint. We will see what happens! Ha! I work in a frame shop and am totally going to make this tomorrow. Love it.